The United States men's national rugby union team, nicknamed the Eagles, represents the United States in the sport of rugby union. The national team is controlled by USA Rugby, which is a member of the North American and Caribbean Rugby Association, one of six regional governing bodies under the International Rugby Board. The United States is the reigning Olympic champion in rugby, having won gold at the 1920 and 1924 Summer Olympics. As of November 10, 2014, the Eagles are ranked 16th in the world by the IRB World Rankings. Their highest ranking, achieved ahead of the 2007 World Cup, was 14th; their lowest ranking was 20th, following a winless campaign in the 2008 Churchill Cup. The Eagles have qualified for six of the seven Rugby World Cups. Their best finish was 10th in 1987; most recently, they finished 16th in 2011. The United States has expressed interest in hosting a Rugby World Cup, possibly in 2023 or 2027. Beginning in 2013, the United States began competing in the IRB Pacific Nations Cup. Previously, the U.S. has competed in the now-defunct Churchill Cup and the Pan American Championship. Informal football games such as rugby became popular in the United States in the mid-19th century. Formal rugby union was played, largely by British immigrants, as early as 1872, when there were rugby clubs flourishing in the San Francisco Bay Area, composed mainly of British expatriates. On December 2, 1882, the first Californian representative rugby team to play an outside opponent, took on a group of rugby-playing ex-Britons, who called themselves the Phoenix Rugby Club of San Francisco. California lost to the Phoenix club 7–4. The sport of rugby union in the United States has always had a close relationship with the sport of American football. Initially, games of rugby, soccer, and hybrid games had been played between American universities, with the first recorded rugby game taking place in May 1874 between Harvard University and McGill University in Cambridge, Massachusetts. The game sparked an interest on college campuses nationwide. In 1876 Yale, Harvard, Princeton, and Columbia formed the Intercollegiate Football Association, which used the rugby code, except for a slight difference in scoring. In 1886 Harvard's Oscar Shafter Howard introduced these rules to the campus of the University of California, Berkeley. American football was fierce, and as injuries mounted, the public became alarmed at its brutalities and President Theodore Roosevelt threatened to outlaw the sport. Beginning with the season of 1906, rugby union became the game of choice at Stanford University, University of California, Berkeley and several other colleges in California but the sport had died out by the outbreak of World War I. The first USA international was played on November 16, 1912 at Berkeley against the Australia national rugby union team (the Wallabies). The visitors won the match 12–8. A year later the U.S. hosted New Zealand at the same venue, but the score was not nearly as close, and the Kiwis ran away with the contest 51–3. The USA team that won gold in the 1924 Summer Olympics in Paris. Rugby union had not been played competitively in most of the USA for more than a decade before the 1920 Olympics. The U.S. Olympic committee decided that because "California is the only state playing Rugby in the US, the Committee will give sanction but no financial aid". The U.S. assembled mostly a California based team, with six players from the University of California, Berkeley. The Olympic Games Committee of the Amateur Athletic Union paid the expenses to transport the team from California to the games in Antwerp. 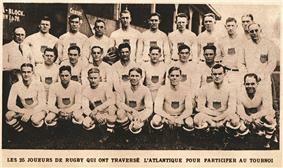 By the time the US Rugby team arrived in Europe, Czechoslovakia and Romania had withdrawn from the competition. France and the U.S. were the only teams left to compete. The USA won a shock 8–0 victory over France to earn the gold medal. The stunned French suggested that the U.S. team tour France, which they did; winning three out of the four matches they played. Between 1920 and 1924, however, rugby union virtually disappeared once again in the U.S., as American football soared in popularity. 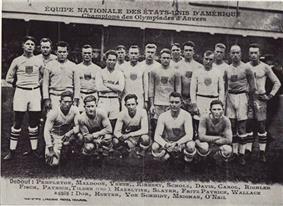 The 1924 Paris Olympics caused France to challenge the U.S. to defend its title. Once again, the U.S. Olympic Committee granted permission but no funds. Nonetheless, seven players of the 1920 team dusted off their boots, raised $20,000, found 15 new players including some American football players who had never played in a rugby union match. The assembled U.S. team was again based heavily from Northern California, with 9 Stanford alumni, 5 from Santa Clara, and 3 from Cal. The team headed for England to play some tuneup matches, where they were beaten four times. The French Olympic Committee (FOC) had scheduled the rugby event to kick off the 1924 Paris Games at Colombes Stadium in Paris. Romania and the U.S. were expected to provide only token opposition for the European champions. On Sunday, May 11, the U.S. pounded Romania 39 to 0, including nine tries. 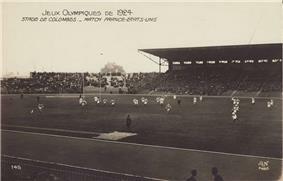 The final was played at Colombes Stadium on May 18 before an estimates crowd of 30,000 - 50,000 that had gathered to watch the rugby final and the awarding of the first medal of the 1924 Olympics. 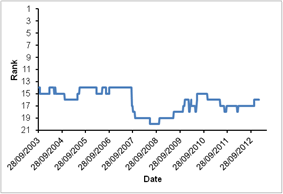 Bookmakers set the odds at five to one with a 20 point spread. However, the Americans were not intimidated, and the American captain Babe Slater wrote in his diary before the match "we are sure going to let them know they have been in a battle." Despite the odds, the U.S. team started well, led by captain Colby "Babe" Slater, and led 3-0 at the half. Heavy tackling by the Americans, derived from American football, intimidated and exhausted the French, as the U.S. scored four tries in the second half to defeat the French 17-3. Rare vintage film footage of the 1924 gold medal match was released in the documentary, "A Giant Awakens: the Rise of American Rugby". Shortly after the 1924 Olympics, however, the International Olympic Committee (IOC) removed rugby union as an Olympic sport. Without the Olympic incentive, the sport's growth in America collapsed and the game remained dormant. The sport then enjoyed a renaissance, beginning in the 1960s and continuing through the 1970s. This created the need for a national governing body to represent the United States in the international rugby community. The United States of America Rugby Football Union (now known as USA Rugby) was formed in 1975 by four territorial organizations (Pacific Coast, West, Midwest, and East). The first Eagles match was played in Anaheim in 1976 against Australia, the Wallabies won 24–12. The USA also performed well against France in Chicago, losing the game 33–14. The next season the Eagles played two internationals, one against England (XV-not capped) at Twickenham on their 1977 United States rugby union tour of England, which they lost 37–11, and the other against Canada, which they also lost, 17–6. The USA played the Canadians again in 1978, and defeated them 12–7 in Baltimore. They then travelled to Canada in 1979 and lost 19–12 in Toronto. The national team came to further prominence during the 1980s, and from the start of the decade, were playing a notably larger number of games every season. They did however lose all three of their games in 1980, all at home. They could not muster up a win in 1981 either, losing 3–6 to Canada, and 7–38 to South Africa. In 1982, the USA drew Canada 3-3. They travelled to Australia in 1983 to play the Wallabies, and lost 49–3 in Sydney. The U.S. played its first-ever match against Japan in 1985, winning 16-15 at the Prince Chichibu Memorial Stadium. Key players included Tom Selfridge, Dan Wack, Tommy Smith, Jack Jensen, and the Sianos—Stephen and Mark. The USA was invited by the IRB to participate in 1987 in the first ever Rugby World Cup in New Zealand and Australia. The USA were in pool 1, alongside co-hosts Australia, England and Japan. The USA won their first ever World Cup game, defeating Japan 21–18 at Ballymore Stadium in Brisbane, with fullback Ray Nelson scoring 13 points. The USA lost both subsequent matches; 47–12 against the Wallabies and 34–6 against England. The USA finished 3rd in the pool, out of contention for the quarterfinals. The Eagles first met Wales at Cardiff in November 1987 as the final match of their 1987 tour, where Wales, who had just finished third in the inaugural Rugby World Cup, enjoyed a 46–0 win. In 1988, the Eagles had mixed success in their tour of Europe, defeating Romania and losing to the Soviet Union. The US notched three consecutive wins from September 1990 to May 1991 — all against Japan — for the first three-match win streak in US history. The USA made their way through a qualifying tournament to reach the 1991 Rugby World Cup in the United Kingdom, pooled with defending champions New Zealand, hosts England, and Italy in a tough group. In their first match of the tournament, Italy defeated them 30–9. Next, New Zealand defeated them 46–6. Hosts England won 37–9 at Twickenham. The USA finished fourth in the pool. In round one of the Americas qualifying tournament for the 1995 Rugby World Cup the USA defeated Bermuda 60–3 to advance to round two. Argentina defeated the Eagles twice in close games in the series to qualify, leaving the U.S. missing out on the 1995 Rugby World Cup in South Africa. The Eagles went close to beating a major rugby nation in a match against Australia at Riverside in 1993 when USA lost 22–26. The Eagles had a successful tour of Europe in 1998, beating Spain and Portugal. Also in 1998, the U.S. played Fiji for the first time, losing 9-18 in Suva. The Eagles set out to qualify for the 1999 Rugby World Cup in Wales. In round four of the Americas qualifying tournament in Buenos Aires, the United States lost 52–24 to Argentina and 31–14 to Canada, but defeated Uruguay 21–16 in their last game to qualify for the 1999 tournament. The U.S. played in the 1999 Pacific Rim Championship, notching its first-ever victories over Fiji (25-14) and Tonga (30-10). The Eagles were in pool E in the 1999 RWC, alongside Australia, Ireland and Romania. In their first game, the USA went down 53–8 in Dublin to Ireland. They lost to Romania 27–25. Australia defeated the Eagles 55–19 in their final game of the tournament, seeing the Eagles finish fourth in the pool. The Eagles, however, had the honor of being the only side to score a try against the eventual champions, Australia, during the entire tournament. In qualifying matches for the 2003 Rugby World Cup the US finished third in the Americas to enter the repechage. The US won the repechage by beating Spain twice to qualify for the 2003 tournament. The US then followed up with victories over Japan and Canada. This was the first time the Eagles had won four consecutive tests since making their international debut in 1976. At the 2003 Rugby World Cup the Eagles finished fourth of five in their pool. In the first match against Fiji, the Americans led 13–3 early in the second half, but Fiji regained the lead and secured a 19–18 win, with the Eagles suffering their ninth consecutive World Cup loss. The U.S. then lost to Scotland. The Americans defeated Japan 39-26, behind 17 points by Mike Hercus, for their first win in a Rugby World Cup since 1987 (also against Japan). The U.S. closed the tournament with a loss to France, concluding the tournament with a 1–3 record. The U.S. toured Europe in November 2004, losing 55–6 to Ireland and 43–25 to Italy. The Super Powers Cup was first contested in 2003 between Japan, Russia and the United States. For the 2004 Super Powers Cup with the addition of Canada. The U.S. beat Russia in the third-place play-off. The 2005 Super Cup took part between the USA, Canada, Japan and Romania. The U.S. lost 30–26 to Canada but beat a Romanian team stripped of their France-based players 23–16 in the third place play-off. 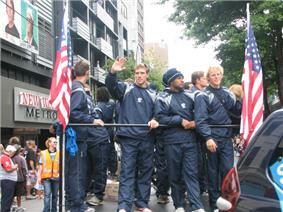 The USA campaign to qualify for the 2007 Rugby World Cup began in 2006. The USA lost 56–7 to Canada, resulting in a home/away play-off against Uruguay. The USA defeated Uruguay 42–13 in the first match and 26–7 in the second to send them through to the Rugby World Cup. 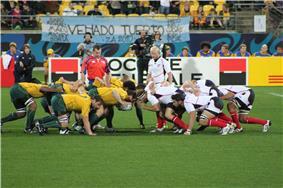 In the 2007 Rugby World Cup, the US joined England, Samoa, South Africa and Tonga in Pool A. The Eagles, ranked 13th in the world standings, lost all 4 games in Pool A, scoring 1 bonus point in the game against Samoa. Coached by New Zealander Peter Thorburn, the Eagles started off with tough match against the defending world champions England, losing 28–10. The US was then beaten by Tonga 25–15, lost to Samoa 25–21, and lost their final match to highly favored South Africa 64–15. The Eagles, however, had a major highlight in the South Africa match. After a Todd Clever interception and a pair of passes, Takudzwa Ngwenya sped down the sideline and outran the speedster Bryan Habana to score a try that received Try of the Year honors at the 2007 IRB Awards. Following the resignation of Scott Johnson, on March 5, 2009 Eddie O'Sullivan was named the new national coach. ^ "International Rugby Board – World Rankings: Full world rankings". Irb.com. Retrieved November 15, 2014. ^ a b c SCRFU History, Southern California RFU. Retrieved September 13, 2014. ^ "Search – Global Edition – The New York Times". International Herald Tribune. March 29, 2009. Retrieved October 17, 2011. ^ "Eagles claim 2011 World Cup berth". BBC Sport. 2009-11-22. Retrieved 2009-11-22. ^ "International Rugby Board – World Rankings: Archive – Detail". Irb.com. December 27, 2010. Retrieved October 17, 2011. ^ "Rugby Union – ESPN Scrum – England Saxons v United States of America at Northampton, Jun 4, 2011". ESPN Scrum. Retrieved October 17, 2011. ^ "USA Poor in Loss to Tonga". Rugbymag.com. June 8, 2011. Retrieved October 17, 2011. ^ a b "USA Wins Bowl at Churchill Cup". Rugbymag.com. June 18, 2011. Retrieved October 17, 2011. ^ "Churchill Cup 2011 News : Final bow for Churchill Cup | Live Rugby News". ESPN Scrum. Retrieved October 17, 2011. ^ "50-Player Pool for World Cup". Rugbymag.com. June 21, 2011. Retrieved October 17, 2011. ^ "Canada Comes Back to Beat USA". Rugbymag.com. August 6, 2011. Retrieved October 17, 2011. ^ "Eagles Squander Opportunity Against Canada". Rugbymag.com. August 13, 2011. Retrieved October 17, 2011. ^ "Japan Edges USA in Rain". Rugbymag.com. August 22, 2011. Retrieved October 17, 2011. ^ "Irish in Battle with Eagles, but Win". Rugbymag.com. September 11, 2011. Retrieved October 17, 2011. ^ "USA Edges Russia in World Cup". Rugbymag.com. September 15, 2011. Retrieved October 17, 2011. ^ "Wallabies Much Too Much for Eagles". Rugbymag.com. September 23, 2011. Retrieved October 17, 2011. ^ "USA Brave in 27–10 Loss to Italy". Rugbymag.com. September 27, 2011. Retrieved October 17, 2011. ^ Rugby World, Dec. 2011, page 40. ^ Shannon, Kris (November 10, 2013). "NZ Maori escape against Eagles". The New Zealand Herald. Retrieved November 10, 2013. ^ This Is American Rugby, Eagles Selected For First Uruguay Match, March 15, 2014, http://www.thisisamericanrugby.com/2014/03/eagles-selected-for-first-uruguay-match.html Retrieved 03-20-2014. ^ "Wallaby greats say US 'sleeping giant' of rugby and hail All Blacks' Chicago Test". ^ "Eagles Select XVs defeat Canada 30-10 at Americas Rugby Championship", USA Rugby, October 15, 2013. Retrieved September 13, 2014. ^ a b "World Rankings". World Rugby. Retrieved 24 November 2014. The U.S. women's national team, officially formed in 1987, has been an international powerhouse since its inception, although more recently have fallen behind other powerhouses such as England and New Zealand on the world rankings. The Eagles won the first official World Cup in 1991, and finished second in the two following World Cups (1994, 1998). The Eagles have set a high standard for international competition, leading an ensuing wave of women's rugby growth and game development worldwide. The US finished 7th in the 2002 tournament. The women's national team traveled to the United Kingdom in January 2006 to play Scotland, Ireland and England, winning all three games. The 2006 Women's Rugby World Cup was held in Edmonton, Canada. Jack Clark (1993–1999). Team failed to qualify for the 1995 RWC. ^ a b c d e f g h i j k United States has awarded international caps for several games against national XV selections and A and B national teams. Below is table of the representative rugby matches played by a United States national XV at test level up until 24 November 2014. 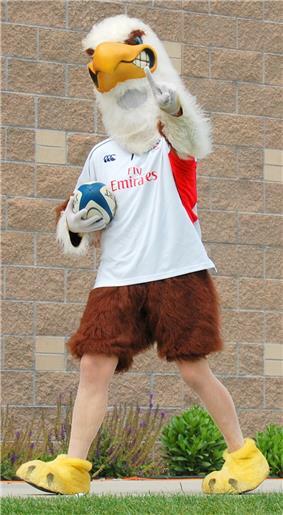 USA Eagles mascot during 2010 Churchill Cup match. Last updated: Canada vs USA, 21 June 2014. Statistics include officially capped matches only. Last updated: 22 November 2014. Statistics include officially capped matches only. Last updated: 23 November 2014. Statistics include officially capped matches only. The USA Selects participates in the Americas Rugby Championship, a tournament featuring the "A" sides for Argentina, Canada, the United States, and Uruguay. The ARC is an annual tournament that has been played every year since 2009 (except for Rugby World Cup years), and replaces the North America 4 competition. The USA Selects best result in the ARC was in 2013, when the USA Selects beat Canada A to take second place. The USA Selects is a second national rugby team for the United States. The USA Selects is a developmental team, usually fielding younger players looking to break into the U.S. national team, and sometimes including amateur domestic U.S. national team players who need more high-level matches. The USA's most recent victory over Canada was a 12-6 victory on July 4, 2009 in Charleston, South Carolina in a qualifying match for the 2011 Rugby World Cup. The Eagles' most recent away win was a 20-19 victory on June 26, 2005. The Eagles' first win against Canada on Canadian soil was September 9, 1995 by a score of 15–14. The Eagles' greatest margin of victory over Canada was in 2003, with a 35-20 win in Buenos Aires, Argentina, in the Pan-Am series. The Eagles' longest losing streak against Canada is seven consecutive losses from May 18, 1996 through August 18, 1998. The USA and Canada routinely play in each other in qualifying matches for the Rugby World Cup. They have met in qualification matches for the 1991, 1999, 2003, 2007, 2011, and 2015 tournaments. The United States' biggest rival in rugby is Canada. The US has played more test matches against Canada than any other country. The two teams first met in 1977, and have played every year since then with the exception of 2010. As of November 2012, the two sides have met 48 times, with 12 wins for the US, 35 wins for Canada, and 1 draw. The Eagles do not have an official home stadium. The Eagles used to play several of their home games at Infinity Park in Denver, Colorado, but with the increasing popularity of the U.S. national team, the Eagles have not played there since June 2012. Since 2012, the U.S. national team has often played in larger Major League Soccer stadiums across the country. The Eagles have played a home match against a Tier 1 nation each June since 2012 before large crowds at BBVA Compass Stadium in Houston, Texas. Since 2012, the Eagles have played at other MLS stadiums, such as PPL Park in Philadelphia and the StubHub Center in Los Angeles. The Eagles play some of their less high-profile matches at minor league soccer stadiums. Titi Lamositele Prop (1995-02-11) 11 February 1995 8 Saracens F.C. Kyle Sumsion Flanker (1990-01-24) 24 January 1990 5 Brigham Young Uni. United States 35-man roster for their 2014 End-of-year tests against New Zealand (1 Nov), Romania (8 Nov), Tonga (15 Nov) and Fiji (21 Nov). Opponent rank is listed as of the date of the match. Green shading indicates a win or tie against a higher ranked opponent. Red shading indicates a loss or tie against a lower ranked opponent. Bolded attendance figures indicate the match is one of the top five highest attended home matches in U.S. national team history. The following table shows the results of the U.S. national team in official test matches during the previous 24 months, as well as upcoming fixtures. The Eagles defeated Uruguay 59-40 on aggregate over two tests during 2014 to qualify for the 2015 Rugby World Cup. During the June 2014 test window, the U.S. played competitive matches against higher ranked Scotland and Japan, and the test window culminated with a 38-35 victory over Canada. Subsequently in November 2014 the Eagles were defeated 74-6 by New Zealand in a match played in front of a crowd of more than 61,000 spectators at Soldier Field, Chicago. Throughout late 2013 and early 2014, a number of U.S. players signed contracts to play professionally overseas. Of the players called into the U.S. national team in March 2014 for two home-and-away 2015 Rugby World Cup qualifying matches against Uruguay, 14 of the 26 were playing professionally overseas, with 10 playing professionally in England. In November, the U.S. lost 19-29 to the Māori All Blacks at PPL Park in Philadelphia before a sold-out crowd of 18,500. In August 2013, the U.S. played a home-and-away series against Canada as part of qualifying for the 2015 Rugby World Cup. The U.S. lost both matches by an aggregate score of 20-40, meaning the U.S. must play Uruguay in 2014 as part of 2015 RWC qualifying. The USA played five matches during the June 2013 international test window, with one test match against Ireland and four matches as part of the 2013 IRB Pacific Nations Cup. The U.S. started with competitive matches against Canada (9-16), Ireland (12-15), and Tonga (9-18), but finished with double-digit losses against Fiji (10-35) and Japan (20-38), and sliding to #18 in the rankings. USA v. Māori All Blacks at PPL Park (2013). The Eagles also played three matches in Europe during the 2012 November international window. The Eagles finished their European tour with 2 wins (Romania, Russia) and 1 loss (Tonga) — the first time since 1998 that the Eagles had concluded a European tour with a winning record — and improved in ranking from 17th to 16th. The Eagles played three matches in North America during the BBVA Compass Stadium in Houston that drew a record crowd of 17,214. The Eagles finished 2011 with a record of 2–8 (2–7 in full tests). The performances in the Rugby World Cup showed improvement, and the win over Russia left the team with a 1-3 record and feeling as a modest success. The World Cup also saw prop Mike MacDonald become both the most capped Eagle in World Cup play (11 caps) and the most capped Eagle of all time at 65 caps. Also notable was the performance of lock John van der Giessen, who achieved the most lineout steals of all players in the 2011 Rugby World Cup, despite appearing in only three matches. The final match saw the Eagles playing Italy for a 3rd place finish in Pool C. The Italians led 20-10 at the half, with the lone US try scored by Chris Wyles. Italy focused their second-half efforts on scoring a fourth try and the bonus point. Pressure by the dominant Italian scrum led to their fourth try in the 65th minute to finish with a 27-10 victory. The defeat marked the end of the 2011 Rugby World Cup for the US. For their third match, the Eagles starting lineup had 14 changes from the previous match, ensuring that each player on the roster received a cap. Australia scored two early tries, but a JJ Gagiano try cut the deficit to 10–5. From that point Australia dominated, leading to the final result of 67–5, the worst defeat a US team has ever suffered to Australia. The Eagles came into the World Cup with their measuring mark for success as being a win over Russia. The Americans took a 10–3 lead into the half after a break by Andrew Suniula set up a try for Mike Petri. The US held on to win 13–6. In their World Cup opening match against Ireland the Eagles defense initially held, before conceding their first try at the 39' mark. The Irish scored two more tries in the second half for a final tally of 22-10, with the US scoring an interception try by Paul Emerick. USA and Irish lineups for their match during the 2011 World Cup. The buildup to the 2011 Rugby World Cup started in June with three matches in the Churchill Cup. The Eagles dropped their first matches to the England Saxons 87–8 and to Tonga 44–13, before defeating Russia 32–25. 2011 was the final Churchill Cup. The Eagles finalized their 2011 Rugby World Cup preparations with three test matches in August. The Eagles lost their first match to Canada 28–22, and lost their second match against Canada 27–7. In Japan they lost 20–14. Their 0-3 record in August resulted in a 1–5 record in test matches for the year in their preparations for the 2011 Rugby World Cup.